Good day! All of you. What happens if I ride 5km on a road like this on a road bike? According to my knowledge, switching from mountain to road increases efficiency upto 50%. Is this true? When talking about going off roads on a road bike, most of the people say road bike 'cant handle it'. What do they exactly mean? Re: Going off road on a road bike? jashn wrote: What happens if I ride 5km on a road like this on a road bike? A road like what? Any description, photos or something like streetview? jashn wrote: According to my knowledge, switching from mountain to road increases efficiency upto 50%. Is this true? Probably not but it depends on so many variables that it might be true sometimes. jashn wrote: When talking about going off roads on a road bike, most of the people say road bike 'cant handle it'. What do they exactly mean? I think it's most often that the narrow (often 23mm instead of the 50 on MTBs) high pressure (100/120psi instead of 30) tyres typically found on road bikes make it an unacceptably uncomfortable ride, possibly risking injury to the rider, and sometimes that the low-spoke-count lightweight wheels aren't strong enough to cope with the impacts of the more extreme lumps and bumps. However, for a contrary view, the Rough Stuff Fellowship has been taking suitable road bikes onto trails for years and there are increasingly many cyclocross, gravel and adventure bikes for sale. I don't worry too much taking my 28mm 60/80psi road bike onto gravel roads and firm dirt/grass track, even if I'd prefer to be on the 37mm 40/60psi roadster on them. Buy one of these https://www.spacycles.co.uk/m1b0s21p3866/SPA-CYCLES-Wayfarer. 1994 MTB with 1999 Shim 105 3x9 transmission & XT mech. Maybe better with bar-end shifters these days, Shim have rendered their MTB mechs incompatible with road ones. It really does depend on a lot of factors. Mainly the specifics of the road bike in question as there is no clear defining line between road and off road machines. Your riding style can have a lot to do with it too. Some people can glide over obstructions and imperfections while others crash and bash across them. Last but not least, as previously mentioned, off road what? Forest trail, mud bath, boulder field, icy slope, grassy hill, tow path, mountain trail etc etc? I have just converted a touring bike to a fast off roader for forest trails. Its specification is very similar to a cyclo-cross bike so it should be fine. If I want to ride up Helvellyn again I still have my MTB which will take the extra punishment in its stride. Not sure if the OP is coming back. Certain paths can be cycled on road bikes; if the path is flat and compacted without stones then you will generally be ok. With lots of holes, or mud, you are asking for trouble. I ended up on a bit of footpath today through a navigational error. It was through leaf litter downhill and then on a rut on the side of a field. I walked basically the whole way as I wasn't getting any traction at all. OTOH canalside paths tend to be ok on 23c. A road bike I think is a good thing to have, just because they are, well, better for roads. And if you want to go properly off road, then have a MTB for that trip. New road bikes are often fitted with 28c tyres rather than 23c or 25c as in previous seasons and I think this will give you a nice contrast to your MTB while being somewhat more forgiving than 23c/25c would be. I dislike taking my tourer unintentionally 'off road' on 32c tyres. I feel it's cruel & unusual punishment on the rims. That's why I have 2 early 90's hardtail 26" MTBs. It's about steering a middle course (sorry). Because in recent years bikes have got more and more specialised, you can get an effect where people assume that you need an MTB to go anywhere off tarmac, simply because that's what normally gets used now. It's not true. On the other hand, in extreme conditions when you're hitting deep potholes and similar unevenness at speed, suspension can let you sail through where previously you'd really struggle. So, if you want to go off-road sometimes, probably don't buy the very lightest out-and-out race machine with factory wheels (reduced number of spokes and so on) - but don't forget that even those get used in Paris-Roubaix (racing on cobbles), Strade Bianchi (racing on dirt tracks) and so on. Only in very recent years have specialised road race machines aimed at such conditions begun to emerge - even more specialisation, you see. Slowster's Wayfarer is an example of a machine that will happily go anywhere the Rough Stuff Fellowship mentioned by mjr cares to take it - which has certainly included up and down major mountains. For less extreme conditions, a somewhat lighter road/touring bike will be fine. That Spa bike seems excessively heavy at 14.5 kg. My 1990 531 mountain bike is 3kg lighter and a 21inch frame. peetee wrote: That Spa bike seems excessively heavy at 14.5 kg. My 1990 531 mountain bike is 3kg lighter and a 21inch frame. There's 1.5kg of 'extra' in the rack, extra-heavy leather saddle, and mudguards. Still rather heavy though everything looks very durable. It's interesting to compare it with the Spa tourer, which also has a 725 frame (https://www.spacycles.co.uk/m1b0s21p298 ... eel-Tourer), for which the quoted weight in the same size is c.12.8kg. The standard build specifications of the two bikes, upon which those weights are presumably based, share quite a lot in common, including that 600+g saddle and wired Marathon tyres for example. I suspect a lot of the extra weight is down to the disc brakes, including the mounts and thicker tubing to cope with the disc brakes. I think in the last 15+ years the weight savings of carbon and titanium frames has somewhat masked the increases in weight as a result of the widespread adoption of components like disc brakes and STIs. Add a couple of water bottles and a saddle bag containing tools and other sundry items and the weight differences are probably less significant or not even noticeable, but even so it would be interesting to compare one Wayfarer with discs and STIs, and another with V brakes/cantilevers and down tube levers. I don't think 725 is a particularly light tube set given its strength. 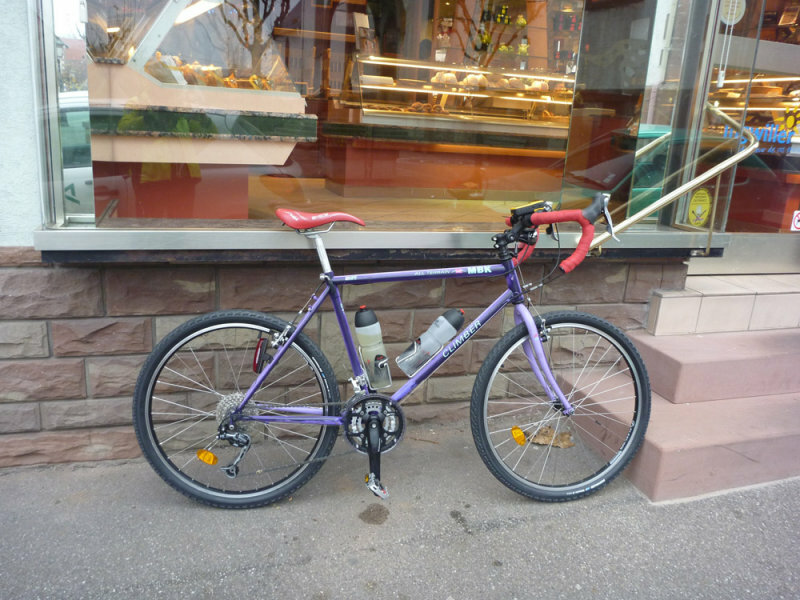 I measured a small Genesis Croix de Fer at close to 9lb. peetee wrote: I don't think 725 is a particularly light tube set given its strength. I'm not quite sure what you mean by that. As I understand it, a steel tube of a given diameter and thickness will weigh the same whether it's 531, 525, 631, 725 or 853 or whatever; the difference between the tubes being not weight but that the higher grade steels will be stronger and more dent resistant. Disc brakes will presumably necessitate that thicker/heavier fork blades and stays from that tubeset are chosen to cope with the extra stresses from the brakes compared with rim brakes. I think Reynolds do make some relatively thin wall 725 tubes, but I imagine they would not be the optimum choice for a mass produced frame for loaded touring and rough-stuff riding which would need to cope with a wide range of rider weights. Yes I understand steel weight is not variable I was just inferring that the greater strength of 725 in comparison to 531 does not translate into a lighter tubeset. The gauges and frame fixings on the Croix de Fer are responsible for adding over 2lb in weight to what was a very durable and carefully chosen set of frame tubes on my MTB. peetee wrote: Yes I understand steel weight is not variable I was just inferring that the greater strength of 725 in comparison to 531 does not translate into a lighter tubeset. Indeed. If someone wants a lightweight frame/bike then the off the peg options now are mostly based on using titanium and/or carbon to reduce the frame weight, rather than using the lighter steel tubes.